Have breakfast for supper! It’s a great way to save money and easily go meatless. Unbelievably, one of the most popular dinnertime meals at my house is breakfast. I know. It’s a morning meal, but for some reason this meal makes everyone break out in a dance when I serve it for supper. And when my kids really like a meal, they hum. It’s weird, but they do. Breakfast for supper is hum-worthy. Thankfully, breakfast can take so many forms, it’s rarely boring. My people love it when I pull out all the stops. That would mean a pan of hashbrowns, a platter full of pancakes, a bowl full of scrambled eggs, bacon, and maybe some fruit of juice. I shoot for somewhat of a protein-carb-fat balance, but sometimes we just carbo-load and call it good. Whether it’s pancakes, scones, waffles, or muffins, we love to have some kind of baked good. And in a pinch, hot buttered toast or English muffins serve well in this capacity. 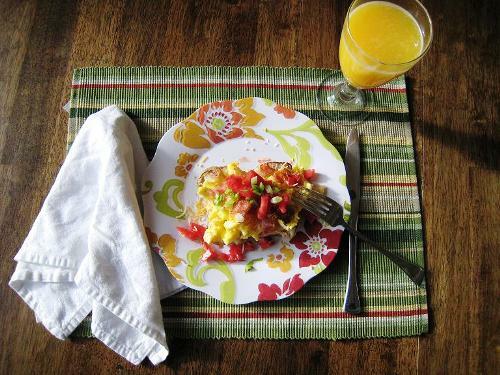 Most of us in the family can eat eggs, so scrambled or fried eggs are usually on the menu. Hubs loves his with a little diced ham. But since one of my crew is allergic to eggs, I try to make sure she has an alternate protein source, like bacon, sausage, or yogurt. 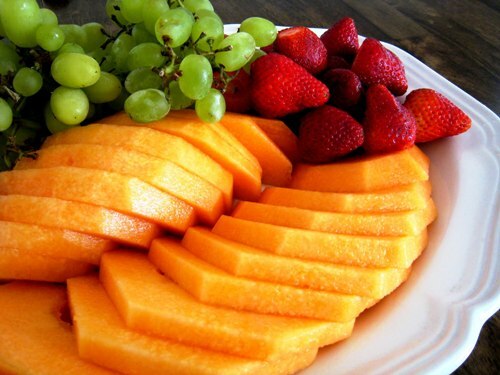 We love to add some fresh fruit to the meal. If we don’t have something in season, then we opt for juice. And if we’re feeling extra happy and extravagant, we have both. 4. Include the humble spud. And a stuffed breakfast potato? Now that is one tasty spud. You can lay out an array of toppings and let your people pick and choose. Most of the toppings can be prepped in advance, leaving you with a quick scrambling of eggs while the potatoes finish baking. Split each potato down the center and smoosh up the insides. Add a pat of butter, if desired. Season to taste with salt and pepper. Allow diners to add their desired toppings. What’s your favorite rendition of breakfast for supper? I prefer breakfast for supper. To me that is the best time to eat it. Hubby makes the best omelet ever! I work full time and our weekday mornings are too hectic for a special breakfast (I do bake bread and muffins for a few of the days), but a full meal breakfast usually only occurs for dinners at our house. I do pancakes now and then for dinner, but my favorite is probably frittata–broccoli feta is a favorite, but I often use a mix of complementary veggies we have on hand. It’s tasty and filling. With a salad and a little fruit on the side, it makes a pretty good dinner for us. 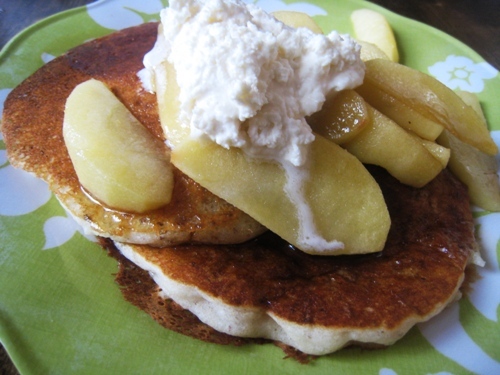 When I make breakfast for supper, I usually make pumpkin pancakes or sweet potato pancakes. The kids eat them up! Breakfast for dinner is my low-prep or lack-of-ideas option. Everyone loves it too. My son gets super happy when we have pancakes. I think I would cry if I were allergic to eggs. I love them, and we eat them frequently. They are usually for breakfast – they cook up so quickly – but we are always amused when I make them for dinner. I do at least usually cook them differently than just scrambled or scrambled omelet, though. Apparently I can do a frittata but not an actual omelet; it always falls apart, so I’ve given up and just scramble it all now. 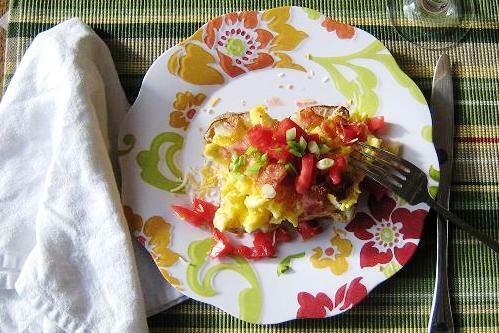 I’ve done a number of stuffed potato varieties, but never one from breakfast foods. I do truly hear that coming to my kitchen table in the near future! We are having breakfast for supper tonight! My family loves waffles, and they can be time consuming for mornings. I usually make grits (we live in the South) along with some scrambled eggs. We like having breakfast for supper too but don’t do it too often. 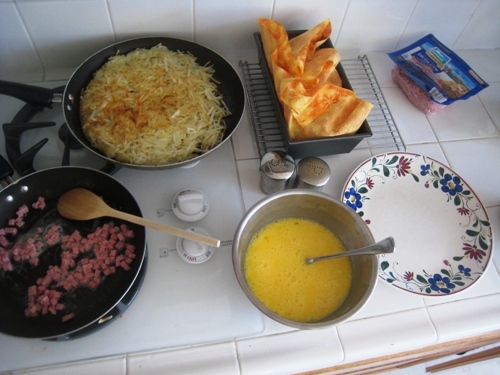 When you make breakfast for supper what do you serve the next morning? I have trouble with variety ideas. Our breakfasts are pretty varied. There are so many choices: granola, smoothies, yogurt, muffins, baguette and jam, etc. I love putting things on potatoes! I often will scrape the insides out and put the skins back in the oven for about 10 minutes to crisp up a bit. Then I add desired filling along with the potato and then cram it back inside. It takes more time but it is delicious! Thanks! Ham slice, biscuits, sawmill gravy, fruit and scrambled eggs. M-m-m-m-m.
My son hums too and does a little happy yummy dance in his chair! I think it is adorable!! !